Jon Ronson chose the pond in Regent’s Park. GB Tell me why you’ve chosen the pond in Regent’s Park. JR It was one of my favourite places when I lived in London. My son used to go on the pedalos. I would find it incredibly grand, with all those cream-coloured Nash houses surrounding it. But I’ve been living in New York for a while and the parks here are so sculptured and the sky so blue, Regents Park seems a little bleak and drab in comparison. Which in a way makes me love and miss it even more. 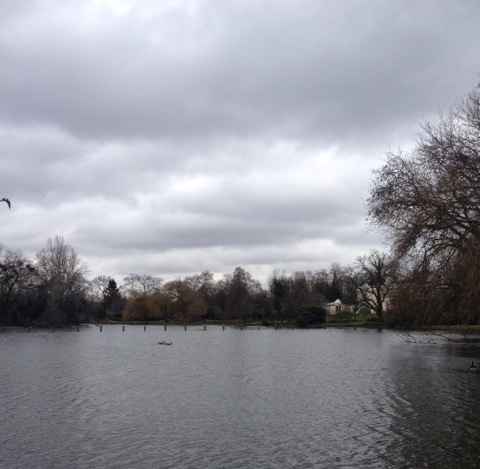 Whenever I’m back in London – which is every two months – I end up walking or running around the lake. Especially because I’ve somehow managed to convince my publishers to put me up at the St Pancras Hotel which is nearby, and another incredibly beautiful London landmark. GB Does the Nash architecture and landscaping contribute to the beauty? The sheer wealth of the surroundings? Do you know much about its history? 1. Paul McCartney used to walk his dog Martha here, of Martha My Dear fame. 2. This boating lake is where the dalmatians met and fell in love in 101 Dalmatians. GB Are you sure it’s a pond rather than a lake? JR I think it’s a lake. The pedalo pond is just behind me, out of shot. GB Does it have any sentimental meaning for you? Is it your personal experience of it that makes it beautiful? Well I have had lots of family things happen around here. My son and the pedalos. Plus he used to go to the swing park to the left (out of shot). Plus he learnt to swim at a swimming club just down the road. Sometimes when Americans visited us in London I’d take them here to show them how beautiful London can be. But loving it is also something to do with me feeling homesick for London sometimes. We’re not as grand as NYC. Our pond isn’t as awesome as the Central Park pond. And that makes me feel weirdly proud of London. GB Is it important to you to find beauty in the world? JR I don’t know. My first thought is that I don’t think so, because I’m just not very aesthetically-minded, but then I think of my favourite places – Runyon Canyon in LA, the Boat Basin in NY, Hampstead Heath… they’re all beautiful places. GB Do you think psychopaths have the same capacity to see/appreciate beauty as the rest of us? JR They sometimes like gold. JR Familiarity and feeling like it’s kind of home.